The European Space Agency’s Rosetta mission to land on comet 67P was one of the most audacious in space history. The idea of landing on a small chunk of icy rock 300m kilometres away from Earth and hurtling towards the sun at speeds approaching 135,000km/hour is incredible – made more so by the fact they actually achieved it. What scientists have learned from the data returned by Rosetta supports the need for another ambitious space mission that has just begun: the Japanese Aerospace Exploration Agency (JAXA) Hayabusa2 mission will intercept not a comet, but an asteroid, landing on its surface no fewer than three times. Data returned by the Rosetta mission has already provided us with many surprises, including the results now published in the journal Science, which reveal that the nature of the water found on comet 67P does not match that found on Earth. Examining the vaporous cloud that encloses the comet nucleus, Rosetta measured the ratio of hydrogen to its heavier form, deuterium, and found it was three times higher than that found on Earth. This is an important discovery, since while water is vital to our existence on Earth, it is not at all obvious where it came from. The Earth was formed from small rocky planetesimals that circled the young sun, coalescing into a planet that was most likely born a dry world. Ices are not found in the planetary formation process until we reach lower temperatures much further out into the solar system. This means that the Earth must have had a water delivery at a later time. One hypothesis is that water came via comet impacts. Comets are formed in the chilly reaches around the giant planets of Jupiter, Saturn, Uranus and Neptune and are heavy in ice. During the end of our solar system’s formation, a large number of these were scattered towards the inner planets via gravitational kicks from their mammoth planetary neighbours. Striking our dry world, their icy contents could have begun the formation of our oceans. But Rosetta’s analysis of comet 67P suggests that our oceans are not filled with fresh comet water. 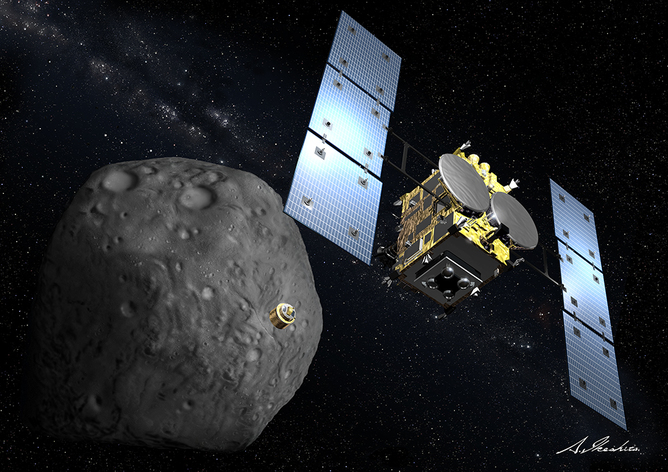 What we need is an alternative source, which leads us to Hayabusa2’s mission to the asteroids. The JAXA Hayabusa2 mission, which launched in early December, aims to intercept asteroid 1999 JU3, touch down on its surface three times, deploy a lander with a trio of rovers and return to Earth with the asteroid samples in 2020. In short, it is a worthy successor to Rosetta. Both comets and asteroids are left-over rocky parts from the planet formation process, but asteroids sit much closer to the Earth. 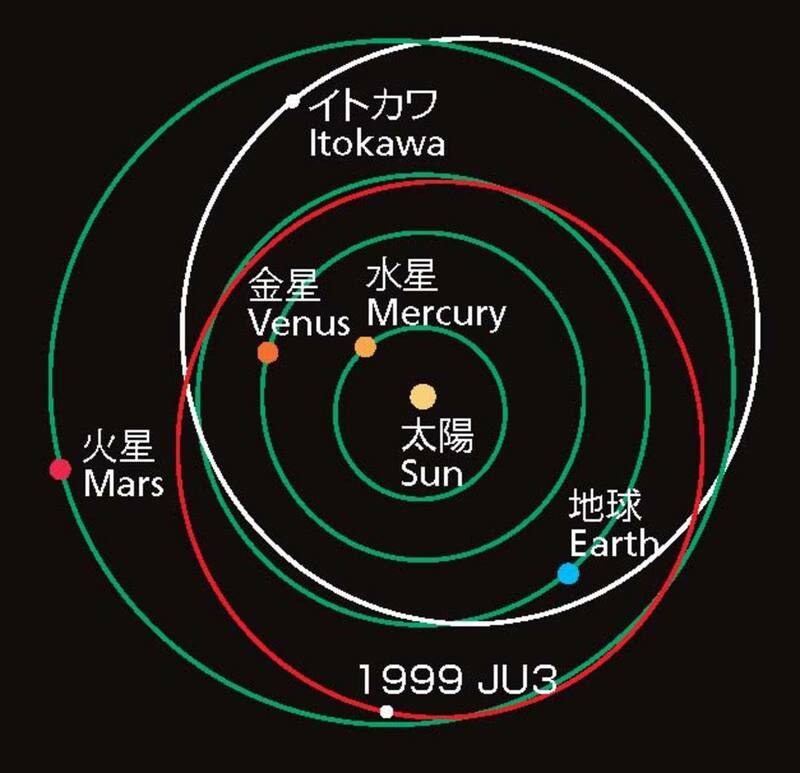 The majority form a band orbiting the sun beyond Mars, known as the asteroid belt, but Hayabusa2’s target is far closer, currently orbiting the sun between the Earth and Mars. Asteroids come in different flavours. 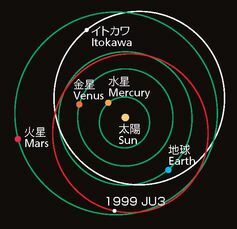 The S-type group have been heated during their lifetime in processes that alter their original composition, while C-type asteroids – the target of Hayabusa2 – are thought to have changed very little since their original formation. As its name implies, Hayabusa2 has a predecessor that visited the S-type asteroid, Itokawa, which showed evidence of experiencing heating up to 800°C. While its exploration illuminated much about the evolution of such space rocks, it held no answers as to the arrival of water on Earth. 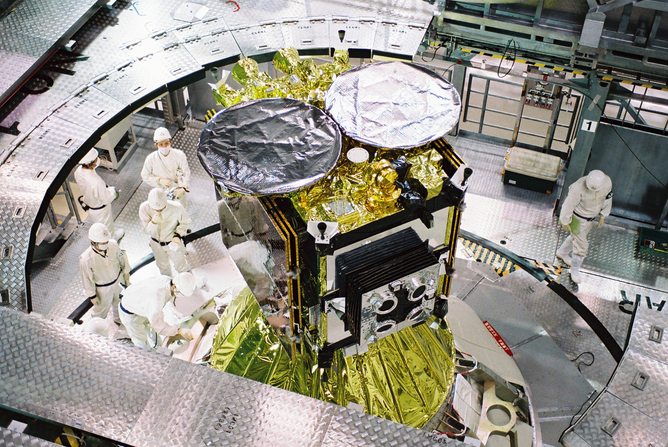 At only around 1km across, 1999 JU3 has insufficient gravity to hold liquid water, but observations suggest it contains clays, which require water to form. This, and its current unstable orbit, implies that it was once part of a larger object that broke apart. After completing an initial analysis, Hayabusa2’s first touchdown will be at the site of the discovered clays. While Rosetta deployed a lander to reach the comet surface, Hayabusa2 will itself make contact with the asteroid, firing a bullet as it descends to break up surface material that it can gather. It will do this twice more at different locations; the third descent will preceded by the firing of a larger missile to bring up rocky debris from beneath the surface of the asteroid. While making a direct landing is risky, the advantage is that these samples can be brought back to Earth for thorough analysis. Despite touching down itself, Hayabusa2 will also deploy a lander. Developed by the same German and French teams that built the Rosetta lander, Philae, Hayabusa2’s MASCOT (Mobile Asteroid Surface SCout) will run on a 15-hour battery and dispatch three small rovers to explore the surface. However, water may be only one part of the secrets to be discovered on 1999 JU3. Previous research has suggested that reactions with water on asteroids are linked to the production of amino acids: the organic building blocks for life. Not only this, but these amino acids seem to be predominantly left-handed; a distinctive feature of those in life on Earth. While amino acids created in the laboratory appear equally as both left- and right-handed mirror images, biology strongly favours the left-handed version. We don’t know the reason for this preference, making the suggestion that such selectivity could have begun in space extremely exciting. If this turns out to be true, then scientists opening Hayabusa2’s sample jar in six years time may not only find the source of our water, but perhaps also the very beginnings of life.